We're all familiar with social networking sites, where you can engage with your friends and followers to communicate or get noticed. But there are also social bookmarking sites, where you can go to find good content to read (and essentially to comment on). This post stresses the importance of commenting on these sites, as long as you abide by their rules and regulations. You can always find content to read on the Internet. But is it always suitable, relevant or worthy? Probably not, especially the usual kind of stuff that is pushed in front of you. For example, I've set up Google Alerts to find the most popular blog posts to my keywords #comments and #commenting. I can't believe the amount of total dross that is selected every day in response to this. Sometimes I can go for days before I can find anything worth clicking on. Social bookmarking sites are somewhere to store interesting posts for later reading. Or a place to search for good content within your chosen niche or subject. The social bit is anyone else can also see your selection. And there is a need to get approval and engagement to increase the visibility of good content. There are many social bookmarking sites to choose from. They all have a slightly different purpose or mechanism depending upon your niche and what you want from the content. Also how you want to promote your own posts within them. Reddit = these allow bloggers to share their post's links within sub-reddits (categories) so readers can search for what is most relevant to them. StumbleUpon = this works through liking and sharing links within an area of interest. The platform 'stumbles' links to the reader to respond to. ScoopIt = readers can pin the articles they prefer into boards and recommend what they find interesting to others. Pinterest = similar to ScoopIt except it works with images, and works best with visually striking content. Twitter = allows readers to capture hashtag threads and its 'like' system also collects posts to be read later. Since these sites are 'social', they depends upon social interaction to get their content noticed. Most of them have communities: the visitors and those that manage the site. It is important to work with these communities if you want them to respond favourably with you. You need to establish yourself as a regular contributor, as well as reader and commenter. This means creating a good profile based around your interests and personality. Create a good impression by being a little different, as well as having a good gravatar and genuine blog links. Then spend some time exploring the site to find out how it works. This looking and lurking practice is essential to learn their etiquette and rules. It gives you a chance to see who is popular (and why), realise which subjects or threads are the best ones. It also lets you analyse how this fits in well with your blog or needs. Where does commenting come into it? This is the social bit: you have to engage and interact a lot before you submit your own blogs. This is where most contributors fall down. The process does not involve you loading up your latest link and then disappearing into the horizon. 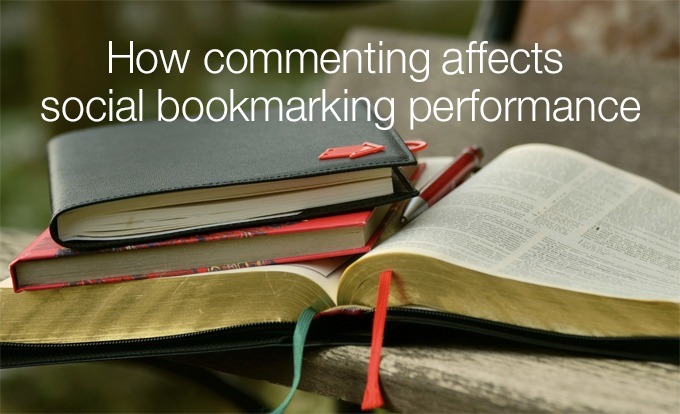 Social bookmarking sites thrive on sharing, voting and comments. Reddit prospers on discussions to drive up the sharing tallies. Twitter works on being topical and relevant within what's happening globally. StumbleUpon responds to upvotes to increase a post's visibility. These sites can't exist without commenting or engagement of some sort. It is the social interaction of the readers, the approval and votes, the sharing and liking, and the comments that spark discussions that make the social bookmarking cogs turn around. It is important to be interested in others before you become interesting yourself. Altruism will make you go much further towards being noticed for the right reasons. The more social love you spread, the more likely people will reciprocate in kind. Some bookmarking sites even score quality points on participants' activities. The more 'good karma' you can generate in relation to engaging with other posts will stand you in good stead when it comes to promoting your own. So if you want to get more traffic to your posts, think how you can find other relevant blog posts to comment on. You can do this either directly, or within the bookmarking site itself. This is all a method of showing an interest in others' work and your appreciation of it. Do you engage on social bookmarking sites? If you are a seasoned social bookmarking site follower, let us know your tips and tricks in the comment box below. If you are enticed to give social bookmarking sites a try, come back later and let us know how you got on. We would all love to hear from you. i need your help can you share details how to increase traffic on my website. Thank you Ravi – this subject is on my to-do list for lots more posts in the future – watch this space!